Vika Gazinskaya, after Christian Dior, Paris, March 2012. 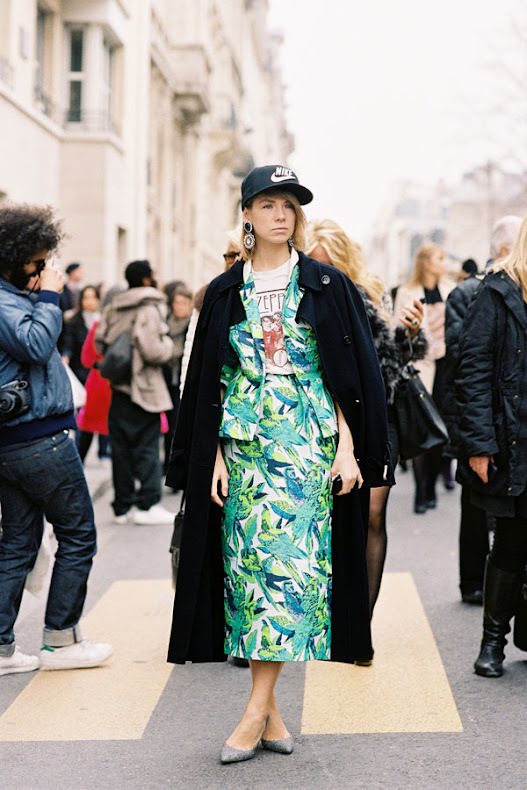 Vika, in pieces from her spring/summer 2012 collection + Nike baseball cap + vintage t-shirt + statement earrings. Another example of not keeping clothes/accessories for "good" (as my mum would say) but wearing beautiful pieces as often as you can. If you have a pair of fabulous statement earrings like Vika's that you save for special occasions, unearth them from your jewellery stash and try them for day (with a denim jacket or white shirt perhaps). A lot of people want have access to her brand clothes. Unfortunately there are no her stores. I don't know if she wants make it luxury brand, but she does. @Lika - yes, I am not sure where Vika stocks her brand- Colette?, other cool boutiques? I know so many people who love her clothes and would be so happy to be able to buy them. how can she wear such eclectic stuff and look so good?! Vika, I bow to thee.